Bringing garden accents indoor is one of my signature decorating themes. In fall I love using natural elements and the abundant squashes and pumpkins readily available for decorating inspiration. I am all about not having to store a lot of “stuff”. Taking a few pumpkins from the market(you can even cook them later!) 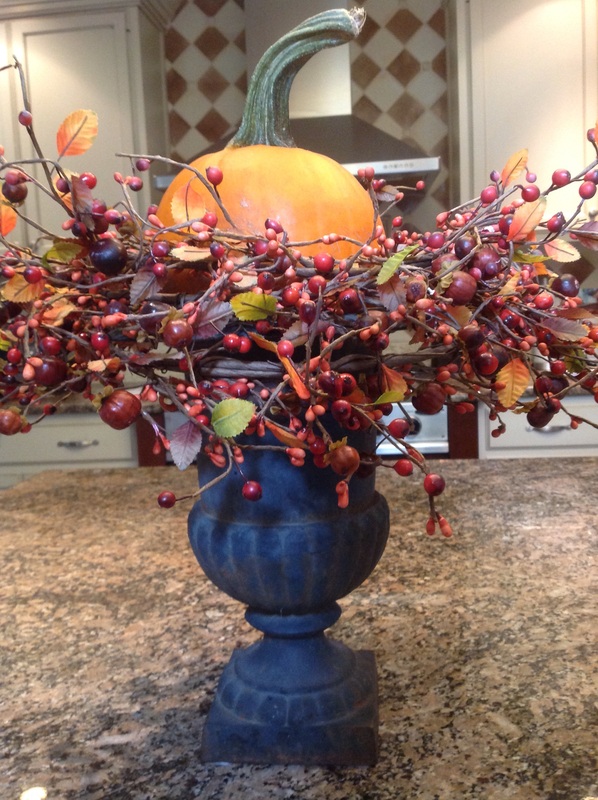 and repurposing a garden urn into an indoor arrangement is a quick, elegant way to decorate for fall. 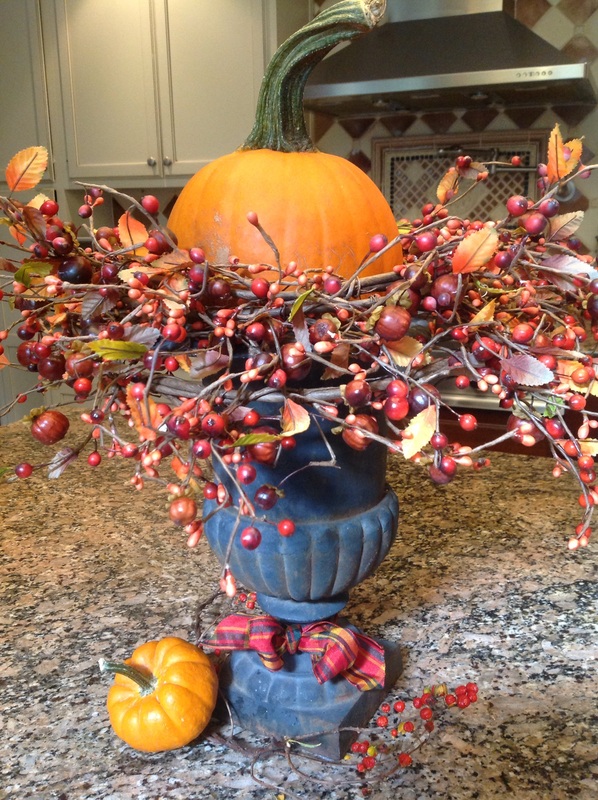 This fall arrangement on my kitchen island was created in no time at all with a black metal garden urn, a sugar pumpkin, some ribbon and a fall wreath. 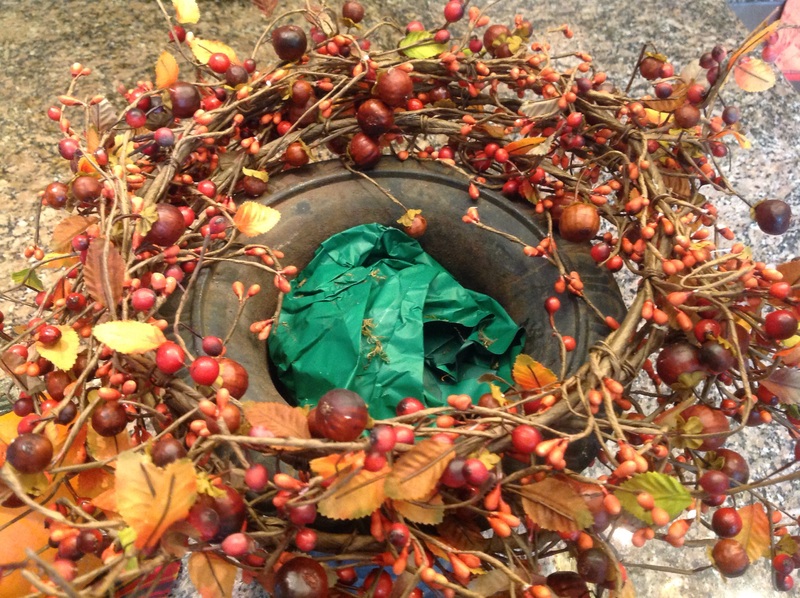 Choose a wreath of the same diameter as the top of your urn and which will have branches and tendrils that can cascade softly beyond the urn, similar to the wreath I chose with small leaves, rose hips and berries. 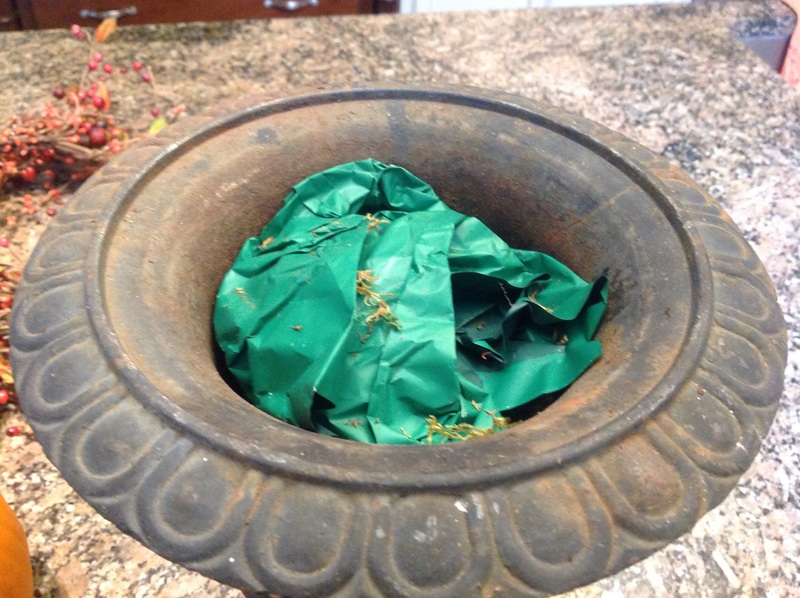 Fill the urn with newspaper or any other filler so the pumpkin can sit above the urn. 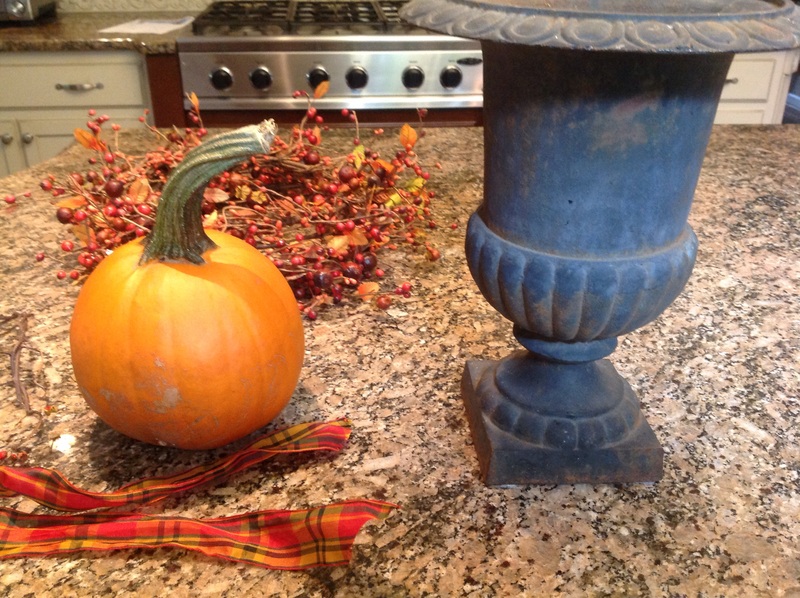 Place the wreath in top of the urn, add the pumpkin then tie a seasonal ribbon at the base of the urn. For added layering and seasonal accents, you can place a branch of bittersweet around the urn’s pedestal and lean a smaller boo pumpkin against the urn. A gorgeous, no maintenance fall arrangement ready in five minutes! Add filler to the urn so the pumpkin can sit at the very top. Seat the wreath on top of the urn. Seat the pumpkin on the filler. Tie a pretty bow around the base of the urn and add a spray of bittersweet and a mini Boo pumpkin and your arrangemnt is done! 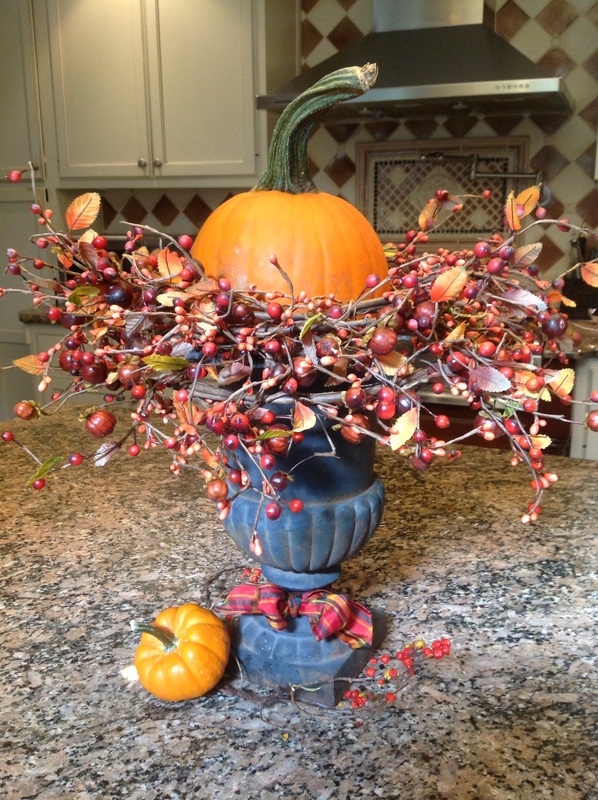 This entry was posted in Crafts, Gardening, Home Décor, Tablescapes and tagged fall arrangement with a garden urn, Fall centerpiece with pumpkin and garden urn by Johanne Lamarche. Bookmark the permalink. I like the bow tied at the base! It makes it look like a fine gentleman urn who has come to call! This is a great look for anywhere inside or out! I know exactly how you feel Alycia! I seem to have projects going on all over the place. To think I used to work 3 jobs and raise 3 kids at home and still get stuff DONE! Are we just wasting time? Glad you liked this fast, little centerpiece! Hooe you are felling better.